Right-handedness is a distinctively human characteristic, with right-handers outnumbering lefties nine-to-one. But how far back does right-handedness reach in the human story? Researchers have tried to determine the answer by looking at ancient tools, prehistoric art and human bones, but the results have not been definitive. Now, David Frayer, professor of anthropology at the University of Kansas, has used markings on fossilized front teeth to show that right-handedness goes back more than 500,000 years. He is the lead author (with colleagues in Croatia, Italy and Spain) of a paper published this month in the British journal Laterality. 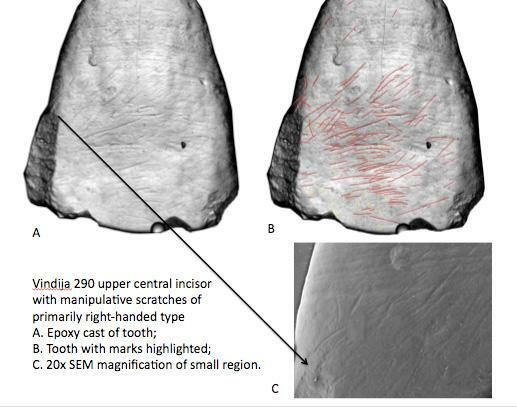 His research shows that distinctive markings on fossilized teeth correlate to the right or left-handedness of individual prehistoric humans. “The patterns seen on the fossil teeth are directly and consistently produced by right or left hand manipulation in experimental work,” Frayer said. The oldest teeth come from a more than 500,000-year-old chamber known as Sima de los Huesos near Burgos, Spain, containing the remains of humans believed to be ancestors of European Neandertals. Other teeth studied by Frayer come from later Neandertal populations in Europe. Overall, Frayer and his co-authors found right-handedness in 93.1 percent of individuals sampled from the Sima de los Huesos and European Neandertal sites. Frayer said that his findings on right-handedness have implications for understanding the language capacity of ancient populations, because language is primarily located on the left side of the brain, which controls the right side of the body, there is a right handedness-language connection.